Does Homer’s legendary Shield of Achilles depict reality in Ancient Greece? In this guest post by James R. Harrington, the question is turned on its head. Are we questioning Homer’s veracity, or are we asking something deeper? Harrington perceives the subtle complexity of the question and cleverly answers, Yes – Not only do Homer’s words illustrate ancient Greek reality, but his Shield of Achilles also depicts a view of reality that was widely shared by the Ancient Greeks. 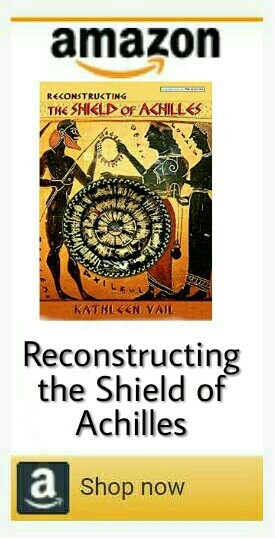 This interesting perspective of ancient Greek reality portrayed on Achilles’ shield caught my attention when it was originally published on Eidos with John Mark Reynolds over at Patheos.com. John kindly passed along my request to contact Mr. Harrington and I am very happy to share this guest post here on The Shield of Achilles with James’ gracious permission. James R. Harrington received his M.A. in Ancient History at California State University at Fullerton and is a member of the Torrey Honors Institute. James has been a classical educator for over 13 years and he and his family currently live in Houston, Texas. “Ancient Greece” covers hundreds of years and miles so that talking about a “Greek world view” or “what the Ancient Greeks thought” poses a problem. Nonetheless, scholars have discerned some essential similarities that united Ancient Greeks culturally across time and space in spite of local variations and inevitable dissenters. At rock bottom, the Ancient Greeks viewed reality as an agon, or contest. The strong properly ruled over the weak in a hierarchy of dominator and dominated: victor over vanquished, gods over men, men over women, adults over children, free over slave, human over animal and plant. Following this logic, the Greeks structured their society in a series of contests that proved who was the superior. The most important of these was warfare, but religious games, poetry competitions, dancing competitions, dramatic competitions, and rhetorical debates were also of key importance. To the Greeks, a boxing match or dance contest were not merely entertainments but expressions of Reality. An excellent literary example comes right at the beginning of Greek literature in Homer’s Iliad. The famous Shield of Achilles (Book XVIII) gives us the Greek world-picture in microcosm. The shield is an image of the cosmos with its round plate symbolizing the earth bounded by the ocean (the waters below) and the stars (the waters above). Upon this miniature cosmos, the drama of human life plays out in a series of ordered and unordered conflicts: man against man, and man against nature. In the scene with the law court, we see ordered conflict of man against man. Due process restrains an argument that might otherwise turn murderous. The struggle is not just between the two bringing the suit, but also between the judges who strive to win the prize for the “straightest” judgment. The final image of the dancers is also a competition as only the most beautiful are allowed to participate in the dance. The companion image is of men in unordered conflict as shown by the image of the city at war. Even the attackers are in conflict with each other as they try to decide whether to take the city by storm or to exact protection money. In the world of nature, we see the king presiding over the conquest of the earth in the form of plowing. There is good order and man reaps the fruit of the earth with which to make feast and offer sacrifice to the gods. In the companion scene, a lion devastates a herd of cattle, throwing the herders into disorder and reasserting the power of nature in the conflict between man and his surroundings. All these struggles play out upon a shield, itself a fundamental article of human conflict. This shield, Achilles bears upon his shoulders Atlas-like in image of a world held and borne up by conflict. Here is the core of the Greek world-picture: that the cosmos is upheld by strife and competition and men make the best of it for the short time that they live and breathe upon the earth. A friend of mine in Classics responded to my article on the Shield of Achilles by saying that it reminded her of the Pre-Socratic philosophers Heraclitus and Empedocles. I followed her lead and found it to be an excellent illustration of the persistence of the Greek world-picture. The Pre-Socratics were a group of thinkers spread across the Mediterranean that rejected the gods of Homer’s poetry in favor of the quest for the “Arche” or basic unit of existence. Their movement culminated in the great triad of Athenian philosophers: Socrates, Plato, and Aristotle. Nevertheless, the Pre-Socratics share some fundamental assumptions about the nature of reality with Homer, and their models of the cosmos have peculiar similarities with Achilles’ shield. As Plato pictures his old teacher, Socrates is a wrestler who pits argument against argument in a competition that will expose which is strongest and, therefore, worthy to be accepted (at least provisionally) as true. Thus, even the philosophers find themselves circumscribed by the limits of Achilles’ shield. * Early Greek Philosophy, Jonathan Barnes Trans., New York, Penguin Books, 1987. p 103. Kind of off-topic, but that portrait of Democritus looks marvelously deranged. lol …and Democritus thought Homer was crazy!